Every staircase has the potential to be a dramatic architectural feature. 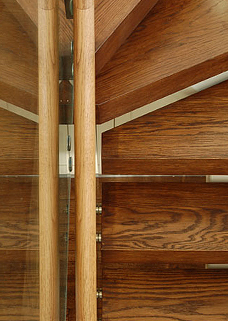 Staircases can be so much more than a practical link between the levels of a building. Whether you favour sweeping curves or angular geometry, sheer minimalism or period ornamentation, your staircase can be a compelling visual statement that defines the mood of an interior. Challenge Engineering Works specialises in handcrafting unique staircases in steel and complementary materials. We work in styles from the traditional to the uncompromisingly contemporary. And, as our name suggests, we relish a challenge. If you wish us to design your staircase as well as build it, we can. Alternatively, we can develop detailed structural drawings to your own design, whether it exists in the form of a highly finished architectural plan or a rough sketch on the back of an envelope. Then, once the design and materials specification meet with your full approval, we progress to the fabrication and installation phases. 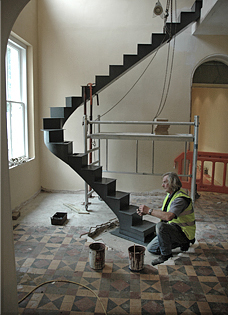 A complete bespoke feature staircase service. As metalworkers, our interior feature staircases typically include stainless steel, (satin, polished or mirror polished), mild steel (galvanised, powder coated, painted or burnished and waxed) or wrought iron as an essential element. However, we have considerable expertise in combining steel with other natural materials to enrich the visual appearance and tactile appeal of your staircase. We work with other metals such as copper, brass, bronze and pewter. Hardwoods, such as oak, ash, beech, walnut and Douglas Fir (planed or in a distressed driftwood finish), also marry beautifully with steel. We can incorporate stone or clear and coloured glass into your design in collaboration with masons and master glaziers. We can even develop designs using unconventional materials such as concrete, leather, laminates and resins. Challenge Engineering Works takes care of every element of your staircase design and manufacture, including treads, spindles, handrails, balustrading and newel posts. However, we can also simply re-style your existing staircase by, for example, replacing the handrails and balusters with designs in steel. All our design, fabrication and installation processes comply fully with current planning and building regulations.